Before LeBron James had completed his sophomore year of high school, basketball scouts were discussing his chances of playing for the National Basketball Association (NBA). Before playing his first regulation game for the NBA, James had signed deals with Nike and other corporations for multimillion-dollar product endorsements. Before he completed his rookie season in the NBA, sportswriters were discussing his chances of joining the most elite players in history in the Basketball Hall of Fame. Comparisons to NBA superstar Michael Jordan (1963–) became common, and some sportswriters began calling James "The Chosen One," indicating the hope that the rookie phenomenon would revive interest in the NBA that had declined since Jordan's retirement. LeBron James, by age eighteen, knew a thing or two about dealing with pressure. James's ability to cope with that pressure has proven to be a critical factor in his success. Sportswriters and his coaches agreed that James has shown uncommon maturity for a player his age, handling his newfound fame and the extraordinary expectations of others with grace. During 2003, prior to his graduation from high school, James declared himself eligible for the NBA draft, the annual process by which professional basketball teams select new players to join them for the upcoming season. The Cleveland Cavaliers, one of the worst teams in the NBA, had the privilege of the number-one draft pick. The Cavs chose James, with the obvious expectation that this eighteen-year-old would lead the team to greatness. While James's first season with the Cavs did not exactly propel them to a championship, he did help his team win twice the number of games as they had the year before, and at the end of the 2003–04 season, James was named Rookie of the Year. Born in Akron, Ohio, in 1984, James is the only child of Gloria James, who gave birth to him when she was just sixteen years old. Gloria struggled to provide for James during his childhood. When James was about five years old, he and his mother moved seven times in a year. For a couple of years during elementary school, James lived with a foster family. Gloria's longtime boyfriend, Eddie Jackson, has acted as a father figure for James, but he was not always around during James's youth, spending several years in prison for selling drugs and, later, for fraud. Regardless of any troubles they may have had, however, James and his mother have a close and supportive relationship. He told Jack McCallum of Sports Illustrated: "My mother is my everything. Always has been. Always will be." "I don't want to be a cocky rookie coming in trying to lead right off the bat.... If there's one message I want to get to my teammates it's that I'll be there for them, do whatever they think I need to do." Taller and more athletic than most other kids his age, James got hooked on basketball early in childhood. Dru Joyce II, who coached James for many of his early years, recalled in an article for the Knight Ridder/Tribune News Service that, while playing in a summer league during elementary school, James was an aggressive offensive player who "really liked to shoot the ball—a lot." Joyce remembered advice he gave James at the time: "I started telling LeBron about passing the ball, how great players make their teammates better. I talked about getting his shots in the flow of the game." Joyce assumed that he would have to repeat this advice many times, reminding the eleven-year-old to be a team player, but he was mistaken. James absorbed every word his coach said and immediately changed his playing style. "That was the last time I ever had to talk about LeBron shooting too much," Joyce recollected. For the 2003 draft, the hype surrounding LeBron James nearly eclipsed another young basketball phenomenon: Carmelo Anthony (1984–). The number-three draft pick with just one year of college basketball under his belt, Anthony would have attracted even more attention than he did, had he not been drafted at the same time as James. His one year of college ball, playing for Syracuse University, had resulted in a National Collegiate Athletic Association (NCAA) championship for Syracuse, with Anthony named Most Outstanding Player of the Final Four, the NCAA championship series. Anthony was drafted by the Denver Nuggets, a team that joined the Cleveland Cavaliers at the bottom of the NBA rankings. Expectations for Anthony, like those for James, were extremely high: the Nuggets would be relying on him to raise them from the depths and eventually make them playoffs contenders. Anthony performed impressively during his rookie season, racking up an average of 21 points, 6.1 rebounds, and 2.8 assists per game. Perhaps the most significant statistic for his team: the Nuggets went from winning just seventeen games in 2002–03 to winning forty-three games in Anthony's first season. Anthony grew up in the rough inner city of Baltimore, Maryland. His father died when he was two years old, and his mother, Mary Anthony, raised Carmelo and his three older siblings by herself. She pushed her son to stay focused and disciplined where basketball was concerned, and she pushed him to attend college before going professional. To fulfill his desire to play for Syracuse, Anthony had to leave his Baltimore high school to attend the prestigious Oak Hill Academy, a Baptist boarding school in Virginia. He studied hard to bring his grades up so he could get admitted to Syracuse, and he practiced basketball as often as possible. He helped the Oak Hill team to a number-three national ranking in 2002, and he earned the grades necessary to take him to Syracuse. Anthony has been described as an unusually mature player who has maintained his down-to-earth style even in the midst of the money, celebrity, and pressure that have come his way. Among the first things he spent his money on after being drafted by the Nuggets were a home for his mother in Baltimore and a youth center there to replace one that was closed down by the police when he was growing up. At the time, James played basketball with his best friends, including Dru Joyce III, the son of his summer-league coach, and Sian Cotton, the son of another summer-league coach, Lee Cotton. Those coaches, both of whom stressed the values of good sportsmanship and being a team player, helped James form the basis of his playing style. James and his pals Joyce III and Cotton, along with Willie McGee, played together every chance they could as kids, and they vowed to stay together all through high school. That childhood promise became a reality as the four boys all attended Akron's St. Vincent–St. Mary High School, a private school known for its basketball program. At St. Vincent–St. Mary, James not only became the school's star basketball player, he also played football for three years and maintained solid grades. James's philosophy about being a team player meant that he spent as much of his playing time passing the ball to teammates and setting up shots as he did taking shots himself, resulting in his extraordinary passing skills. His high school coaches asserted that James could have been a player who averaged fifty to sixty points per game. Instead, his average was closer to thirty points a game, but he helped his entire team play better basketball. Many coaches and sportswriters have described James's maturity and selflessness as a player; Keith Dambrot, who coached James for his first two years of high school, summed up the key to James's success in the Knight Ridder/Tribune News Service article: "LeBron is a basketball genius, there is no other way to say it." Lebron James of the Cleveland Cavaliers (left) drives around Shandon Anderson during a 2004 game against the New York Knicks. to a stadium at University of Akron to accommodate the numerous fans who wanted to see him play. Some of those games were even broadcast to national audiences on ESPN and ESPN2. With all that attention came some mild controversy: James received some negative press after his mother obtained a $100,000 loan to buy him a brand-new Hummer H2. He was briefly declared ineligible to play after accepting a gift of two sports jerseys, valued at $845, from a Cleveland store. The abundant attention he had received for his playing, many observers suggested, had made James—nicknamed "King James"—feel that he was entitled to the financial benefits of a seasoned professional. On the court, however, all agreed that James kept his head and continued to play like the member of a team rather than a basketball superstar. Many observers had wondered, from James's earliest high school years, whether he would go to college or attempt to be drafted into the NBA straight out of high school. Eager to test his skills at the next level, James considered declaring for the draft as a junior, trying to get an exception to the rule that would have barred him from the draft before his graduation year. He decided instead to complete high school, announcing during his senior year that he would declare himself eligible for the 2003 NBA draft. James's decision to go professional right out of high school renewed the debate over whether players should be allowed to play for the NBA at such a young age. Supporters argue that if the player possesses the skills, he should be allowed to earn a living playing his sport. Critics suggest that most high school kids would benefit more from going to college first, using those years to improve their playing, acquire an education, and become more mature. Ignoring the debate and following his own instincts, James opted to skip college and head for the NBA. Coming off a terrible season, tying for the worst record in the NBA, the Cleveland Cavaliers had a chance to reshape their future in June of 2003: they had the number-one draft pick. They chose James, pinning their hopes on the eighteen-year-old player to turn their fortunes around. At six-foot-eight and 240 pounds, James certainly looked the part of an NBA player. But many wondered if he could live up to the hype surrounding him and compete in the far more competitive arena of professional basketball. 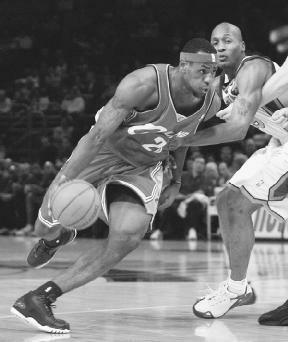 When James made his official NBA debut in the fall of 2003 in a game against the Sacramento Kings, he answered the concerns of many doubters. The Cavaliers lost the game, but James played better than most rookies could hope for in a debut game—and better than any rookie straight out of high school—with twenty-five points, nine assists, six rebounds, and four steals. While he occasionally showed his inexperience and youth, and while he did not live up to the most outrageous expectations that he would play like Michael Jordan right out of high school, James did perform extremely well in his rookie season. He ended the 2003–04 season with an average of 20.9 points, 5.5 rebounds, and 5.9 assists per game. He ranked among the top fifteen players in the league in a number of categories, including points per game, total points, assists, and steals. In April of 2004, James was named the Rookie of the Year for the 2003–04 season. Speaking of the rookie's innate abilities on the court, Cleveland power forward Carlos Boozer told McCallum of Sports Illustrated, "You can only call it court sense. The way he takes advantage of a situation right away can't be taught. He just has it." Barring injury, James will earn $19 million for his first four years with the Cavs, an amount that seems downright insignificant when compared to his endorsements. In a sponsorship deal that will pay James more than any other basketball player except Michael Jordan, Nike signed the player to a seven-year, $90 million contract—and that contract was signed before James had even inked a deal with the Cavs. He has also agreed to promote Coca-Cola products, including Sprite and Powerade, and Bubblicious bubblegum. Predicting the amount of money James will generate for the Cavaliers, for Nike, and even for other NBA teams, Forbes magazine suggests that those investing in James will be repaid handsomely. During his rookie season, attendance for Cavs home games increased by fifty percent from the prior season. James sparked so much hype that basketball fans around the country sought out tickets for the Cavs' away games, moving the Cleveland team from last in the league for road attendance to first. As for his corporate sponsors, Nike released the first shoe endorsed by James, the Air Zoom Generation, in December of 2003. At $110 a pair, Nike sold 72,000 pairs in the first month alone. Bob Williams, the CEO of a company that matches athletes with corporations for endorsement deals, described to Sports Illustrated in 2003 the hurdles James will encounter in his first few years in the NBA: "He has to dominate his position, take a downtrodden franchise to the playoffs and eventually to a championship. He will make a lot of money and live happily ever after. But no one has ever had more expectations put on him than this young man right now." When reporters have asked him about dealing with the enormous pressure placed on him, James has frequently uttered what has become a sort of motto: "I can handle it." And with one successful season under his belt—both on court and off—many commentators have come to believe that perhaps he can. Jones, Ryan. King James: Believe the Hype—The LeBron James Story. New York: St. Martin's Press, 2003. Morgan Jr., David Lee. LeBron James: The Rise of a Star. Cleveland: Gray and Company, 2003. Badenhausen, Kurt. "Slam Dunk." Forbes (February 16, 2004): p. 64. Chappell, Kevin. "Can LeBron James Repeat the Jordan Miracle?" Ebony (January 2004): p. 124. Finnan, Bob. "Early to Rise." Sporting News (October 20, 2003): p. 40. McCallum, Jack. "You Gotta Carry That Weight." Sports Illustrated (October 27, 2003): p. 68. Pluto, Terry. "LeBron James, Once a Lanky Kid, Has Come a Long Way to the NBA." Knight Ridder/Tribune News Service (April 20, 2004): p. K1569. Taylor, Phil. "Carmelo Anthony Has a Secret." Sports Illustrated for Kids (November 3, 2003): p. 24. LeBronJames.com. http://www.lebronjames.com/hsc/hscMain.cfm (accessed August 1, 2004). "LeBron James." NBA.com. 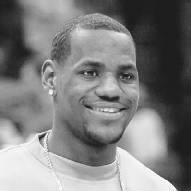 http://www.nba.com/playerfile/lebron_james/index.html?nav=page (accessed August 1, 2004). "LeBron Watch." Cleveland.com. http://www.cleveland.com/lebron/ (accessed August 1, 2004). Morgan Jr., David Lee. "The Rise of a Star." HoopsHype. http://www.hoopshype.com/articles/lebron_morgan.htm (accessed August 1, 2004). i wish i ca meet lebron. im a real big fan. i want to play ball just like him.